ASTANA – Kazakhstan’s secondary school students will soon face off in the national aerospace-themed competition Nazarbayev Fund Schools Challenge – 2019 organised by Air Astana, Cranfield University, the Foundation of the First President, the Ministry of Justice, National Institute of Intellectual Property, Nazarbayev University (NU) and Samruk Kazyna Trust Social Projects Development Fund, reports the airline’s press service. Photo credit: Air Astana Press Service. Teams of a schoolteacher and four English-speaking school students aged 16 to 18 with experience in pursuing projects independently and achievements in mathematics and the natural sciences may register to participate on www.shapagat.kazpatent.kz/ru/nfsc before the May 10 deadline. The jury will accept submissions in areas such as architecture, biotechnology, engineering, information technology, oil and gas, mining, robotics and transport. Seventeen teams from each region in the country will be admitted to the final qualifying round in the capital June 25-27. 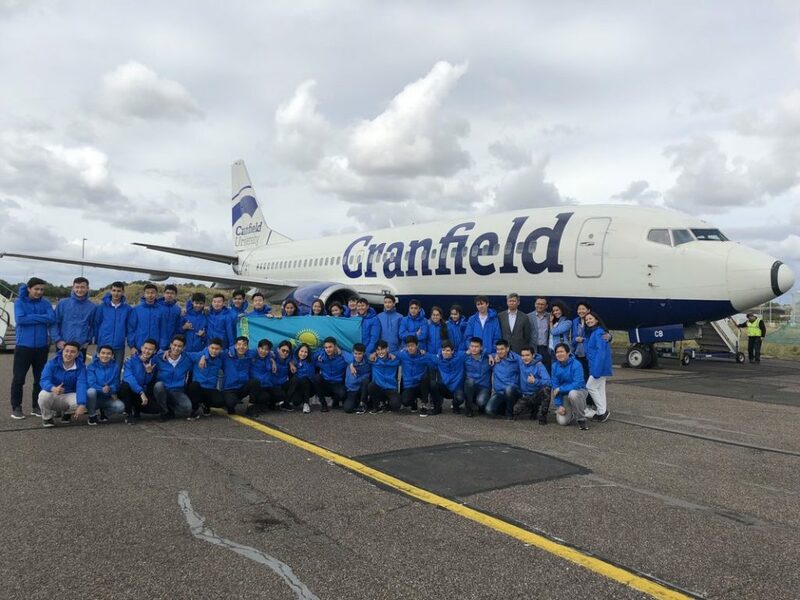 Finalists will make a seven-day study trip to Cranfield University in the United Kingdom Aug. 19-26, and an award ceremony will be in Kazakhstan Oct. 15. The competition is held annually to develop schoolchildren’s academic potential, encourage a creative approach to science and familiarise the public with the scientific achievements of young innovators. Last year, 85 students from Astana, Almaty and Shymkent attended the July 24-26 final qualifying round at NU. The jury included Air Astana Senior Maintenance Manager Ruslan Shayakhmetov, Samruk Kazyna Trust Corporate Communications Sector Chief Manager Assem Issabekova and representatives from Cranfield University’s Schools Aerospace Challenge Ian Hollingworth, Frank Jukes and Graham Stark. Finalists Yerlan Yessirkepov, Yernar Bimukhanbet, Almaz Kydyrmin, Anvar Nakov, Sultanali Seidally, Azat Dzholamanov, Magzhan Zhumanazarov, Dias Tleukhanov, Zulfiya Imanbekova, Damir Yessimbekov, Beksultan Ryszhan, Turarbek Kadyrgaziyev, Sabina Kazbek, Sultan Sanakbekuly, Bauyrzhan Kubeyev, Aslanbek Turar, Alber Adilov, Malika Gabdullina, Sultanmakhmut Yessenkeldiyev, Dias Sagynat, Talant Talipov, Ilya Schmidt, Kadirbek Sharau, Nurzhan Kongratbayev, Gulnur Kulzhanova, Karina Temirzhan, Temirtas Sapargaliyev, Artyem Fartygin, Dinmukhammed Begmetov, Yerserik Miranbekuly, Spandiyar Abutalip, Yeldos Yegizbayev, Yevgeny Demidenko, Damir Sharip, Sultan Orynbay, Dikesh Shakarim, Nursultan Kobeisinov, Aikun Beksultanova, Alisher Maratov and Tomiris Zholdassova made an Aug. 19-26 study trip to Cranfield University. The Year of Youth in Kazakhstan was launched Jan. 23 by the then Kazakh President Nursultan Nazarbayev, and the country will see a number of youth-oriented initiatives in the year ahead.